A black and white negative of John Blow. Brian Winter took a photograph of the original photograph that is held in a private collection. John Blow was born in Humberstone, Lincolnshire, England on November 13, 1819. After leaving school he farmed with his father and then went to Hull, England to learn the business of shipping clerk, wharfenger and warehouse man with the Hull Dock Co. In 1854 John Blow came to Whitby and was employed by James Rowe and Company. After managing the firm's office for 17 years he became an entrepreneur dealing in imports of coal, salt, water lime and gypsum from the United States. He also owned a number of sailing vessels. 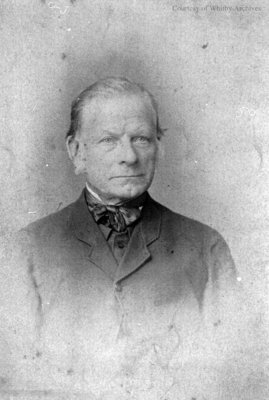 John Blow was Deputy Reeve of Whitby from 1877-1878, Reeve from 1883 and Mayor from 1889-1890. He retired in 1891. He died at Whitby on December 30, 1901 and is buried at St. John's Anglican Cemetery, Port Whitby. John Blow, c.1880, Photographer Unknown. Whitby Archives A2014_005_001.